Meet the mascot of my Web site, Mr Shmulik Karhon. Mr Karhon (aka Mr Samuel Iceberg) is a desert penguin. He is Jewish, obviously. I imagine his family is from northern Iraq. He is a traditionalist but not really religious. 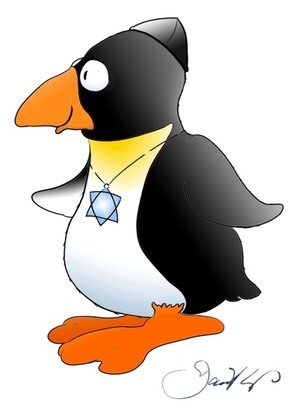 He is conservative, like most penguins, but also progressive, like most Jews. And he is not afraid of being thrown into the sea.